President Barack Obama’s job approval rating has settled down into a significantly smaller range in 2014 than it has in any of his five previous years in office. This year, through the week that ended Dec. 14, Obama’s weekly approval averages have ranged between a high of 45% and a low of 40%. The only other year even close to that narrow range of weekly approval averages was 2010, when his weekly averages ranged over eight percentage points, from 51% to 43%. In each of the other four years, the range in his job approval fell between 11 and 18 points. 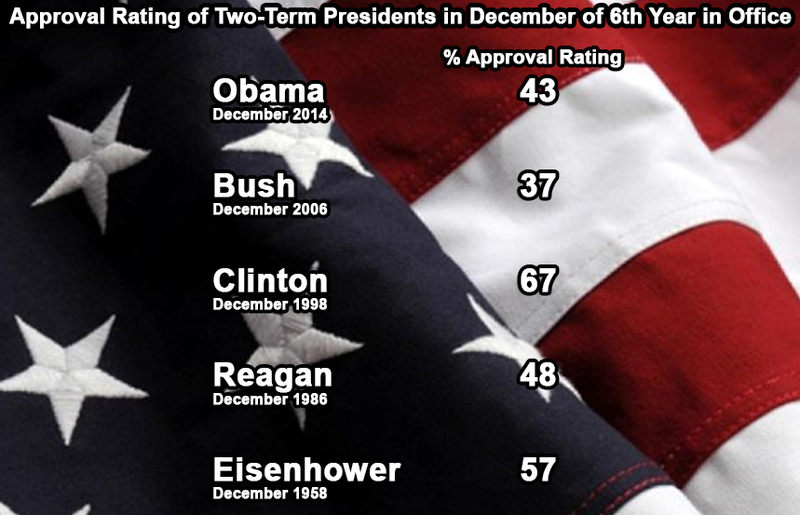 Of course, there are remarkably few presidents since the advent of modern polling who actually were elected to two terms and served through to the end of their sixth year in office, where Obama is now. In other words, there aren’t a lot of presidents with whom to compare Obama at this point in his administration — only Dwight Eisenhower, Ronald Reagan, Bill Clinton and George W. Bush. The data show that Obama is doing better than George W. Bush was at this point in his sixth year, but not doing as well as any of the other three presidents. Note: Three additional Presidents (Abraham Lincoln, William McKinley, and Richard Nixon) were elected to a second term, but did NOT complete their second term due to assassinations and a resignation.